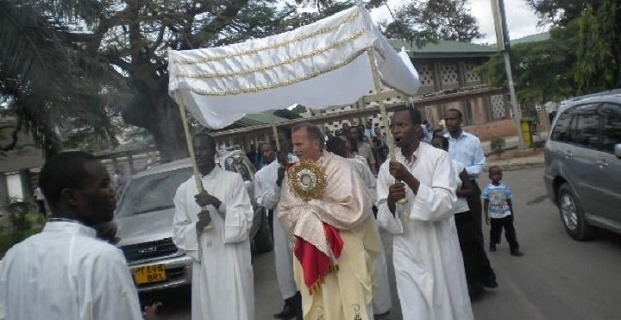 My most recent assignment in Africa took place in the city of Dar es Salaam on the shores of the Indian Ocean where I served as Catholic chaplain at the national medical university. Out of a student body of 1600, 800 were Catholic. We enjoyed a vibrant Catholic community. The university was adjacent to the large national hospital that had 1200 beds. In addition to serving the needs of my students, I also occasionally visited patients in the wards. I would bring them Holy Communion and the sacrament of the sick. So often, these people were in great discomfort and pain. Patients could wait days, even weeks for the results of testing (blood, X-ray, whatever). The hospital was so overcrowded. But, it never failed. 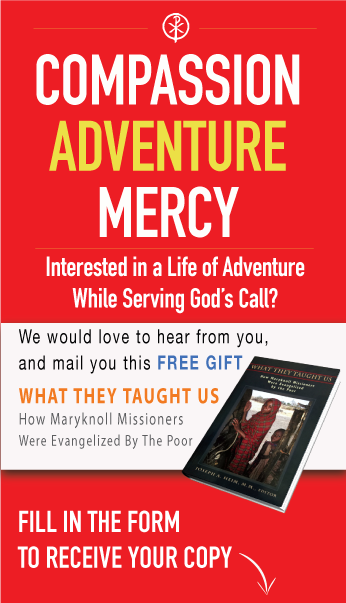 Whenever I visited and patients received the sacraments they would smile and, at least for a few brief moments their bodies would relax and the pain would seem to cease. One year, on the feast of Corpus Christi, it had been a busy day. 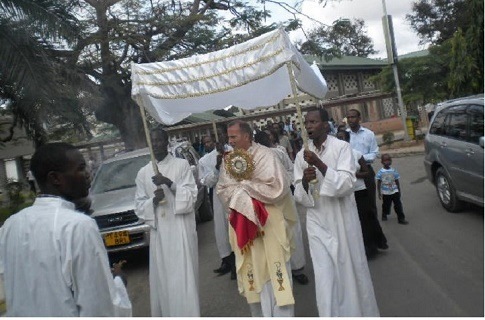 In Tanzania there is not only Mass on this day, but a long procession outside carrying the Blessed Sacrament. I wasn’t able to leave church until dusk and just as I was leaving some students came asking if I could visit one of the wards where an elderly woman had asked that morning to receive Communion on this special feast day. So, off we went. We entered the ward; visiting hours were over so things were very quiet. Patients were settling in for sleep. The woman I came to visit was sitting on the bed. She was an elderly slight woman with silver hair, the image of a typical Tanzanian grandmother. She had fallen at home and broken her hip. When she saw me coming from the distance she raised her voice: “I knew you would come. Today is the feast of the Holy Eucharist and I knew that you would bring me Jesus.” She began to sing an old song (originally a Latin song translated into Swahili) about the Body & Blood of Christ. I gave her Communion and suddenly many of the patients in the ward asked to receive. Despite all of their problems and discomfort, there was so much joy in the ward during this precious moment as everyone sang and rejoiced. We Catholics talk about the real presence of Jesus in the Eucharist. I can testify to this through the many experiences in Tanzania where I witnessed Jesus’ presence in the faces of people like this old grandmother.